Purchase the Sweetheart Ride for Two - 50% OFF!! A top pick for Romance! 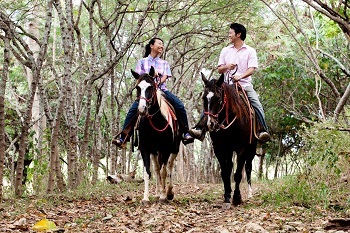 The Sweetheart Horseback Ride is a 2 hour, private party experience. One of our wranglers will guide you and your guest through our mountain trails to a nice scenic lookout spot and dismount them. 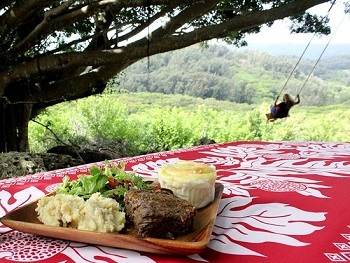 A picnic lunch will be provided and the wrangler will leave the party alone for 1/2 hour private time to enjoy lunch and a beautiful ocean view. This ride is suitable for all skill levels. Offer is for 2 riders only. No pregnant riders will be allowed. This is a great way to spend “sweetheart time”, celebrate birthdays or special occasions. 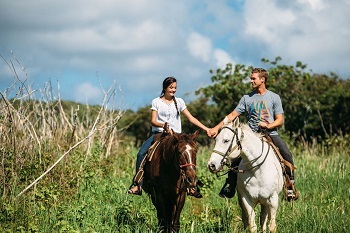 If you are comfortable on horses and would like to add some advanced ride features we can adjust that ride for you since it is a private party. Our weight limit for any rider is 240 lbs., strictly enforced. • Riders must be over 7 years old and weigh less than 240lbs. What to Wear • Long Pants • Covered Shoes • Sunscreen!! Check-In Information: Please check in 30 minutes before your ride's start time. Each rider must attend a 15-min safety briefing prior to riding. -We will reschedule rides based on availability. -The offer is for two riders only - additional people can be added to your party but will pay full price. Rescheduling/Cancellation (with LESS than 24 hours):will not be rescheduled nor refunded. However, Reschedules with less than 24 hours may be accommodated when possible with a $40 fee. We are CLOSED on Sunday. Cancellations for Monday rides must be made by Saturday at 5:00 pm. -Arriving late for your tour will affect your tour length. All tours need to end at the scheduled time. It is your responsibility to ensure you have proper directions to our location. -We plan to ride rain or shine. In the event, we cancel a ride due to conditions we feel are unsafe for our trails, no charges will be applied and ride will be rescheduled. -If a party calls in to cancel their ride because they don’t want to ride in the rain and we plan to carry out the ride, no refund will be given and ride will not be rescheduled. No Shows: Will not be rescheduled nor given a refund. Only 1 order can be purchased per person. Blackout dates: 12/24 – 1/2. Riders must be over 7 years old. Our weight limit for any rider is 240 lbs. Additional restrictions apply.